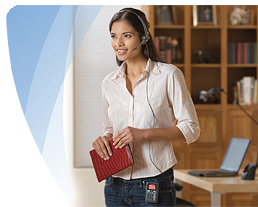 Ideal for home and small-office use, the CT14 DECT 6.0 cordless headset phone offers enhanced sound quality and DECT 6.0 wireless technology for an interference-free wireless range of up to 300 feet. 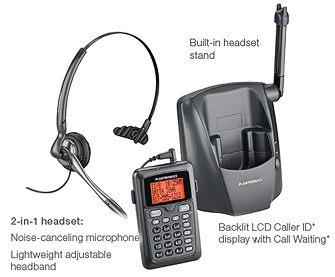 Equipped with everything your busy life and work require, the CT14 includes a convertible headset that can be worn over-the-head or over-the ear, a phonebook for up to 70 entries, a 30-caller ID memory with a simple "save to phonebook" feature, and a convenient charging base. The CT14 relies on the DECT 6.0 frequency (1.9 GHz) for all communications, giving you a roaming range of up to 300 feet and significantly better reception when compared to standard 2.4 or 5.8 GHz cordless phone systems. The DECT 6.0 frequency is used exclusively for voice communication applications, which means that wireless networks or home appliances such as microwaves will not interfere with your calls. With the enhanced range and clarity that DECT 6.0 offers, the CT14 gives you the freedom to move about your house or office without compromising on call quality. You can also extend the range of the system even further than 300 feet by registering the dial pad with up to four additional charging stations (sold separately) -- a great feature for multi-story homes and offices. Thanks to its flexible mouthpiece, which lets you position it precisely where you need, the CT14 will give you the professional-class sound quality you require. And its noise-canceling microphone transmits your voice clearly without the background noise that a busy home or small office can produce. The CT14 features a 2-in-1 convertible style headset that gives you the option of wearing it either over-the-head or over-the-ear. You may want the comfort and stability for long calls or conferencing that the over-the-head style offers, and when it's time to switch, simply disconnect the headband, attach the earloop, and wear the headset over your ear. Either way, you get a comfortable fit that is designed for all-day use. The ultra-compact dial pad is also designed for all-day wear, with an integrated belt/clothing clip that allows you to talk hands-free as you roam away from your desk. It includes a built-in memory that stores up to 30 caller ID numbers and a built-in phonebook for up to 70 contacts. The dial pad puts controls for volume, mute, one-touch voice mail, and more within easy reach. It also offers several standard telephone functions, such as call waiting* and redial. With the easy-to-read backlit LCD caller ID display, you can always see who's calling regardless of your lighting conditions. This dial pad offers up to 10 hours of talk time and 8 days of standby on a single charge. 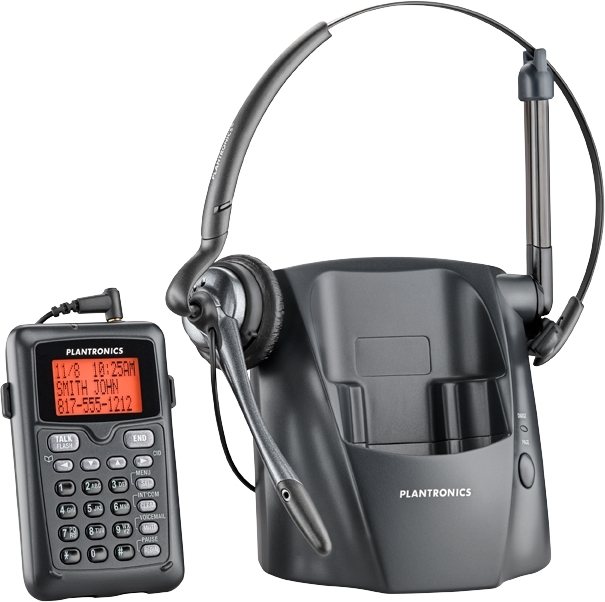 The system includes the dial pad, headset, and charging station with built-in headset stand. It is backed by a one-year limited warranty. *Call waiting and CallerID require a separate subscription through your telephone service provider.